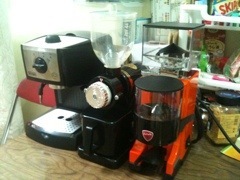 True turkey coffee is fresh roast bean, grinded as flour powder and brewing lot of golden bubble. Yes, I think it is a traditional brewing method in Turkey. I prefer to try turkey coffee in a traditional cafe rather than brewing at home. I think so and agree !! 之前見到utube有個人話每次加完水, 佢會fill up 返個壼, so that 重量差唔多~~咁會易控制D, 其實岩唔岩呢? 每次加完水, fill up 返個壼, and make same temperature how long to do this ? I watch Japanese drip videos million times, no one do this, only make the pot as hot as they can and 1 time filled up 1 time drip making. Thermometer response time 6 SEC. for normal cooking ones - best ones. Industrial ones 0.4 SEC 1 time. It is very difficult to use accurate temp. to drip for me.